This dramatic hilltop is the traditional site of the execution of John the Baptist (pbuh). 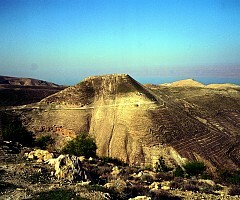 It lies less than 20 km southwest of Madaba at the King's Highway on a stark promontory (720 m), overlooking the Dead Sea and protected on three sides by deep ravines, A fortress was first built here by the Hasmonean ruler Alexander Jannaeus (103-76 BC) to defend Perea against the expansionist Nabataeans. 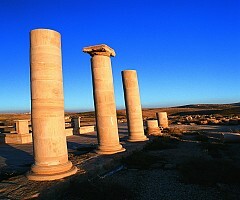 as the Romans destroyed it in 63 BC, and it was restored then by Herod the Great (37-4 BC). Far removed from the tourist circuit, the quiet of this area transports you back into Biblical times. Indeed, shepherds and their flocks still find shelter in the myriad caves and grottoes around Machaerus. Hike down towards the Dead Sea from Machaerus and you will truly feel that you are on top of the world.